Happy hours will be spent in this large two bedroom villa. Located directly above the shops and restaurants in the heart of Shelter Cove Harbor, Harbourside Villas is the perfect place to enjoy activities and entertainment. Watch amazing sunsets and yachts from your private balcony. A private pool is located on site and beach access in Palmetto Dunes is available with the free shuttle service or parking in designated areas. Trident is wonderful! Deb was so helpful and provided us with everything we needed for a great vacation here. They really care about your experience and are there whenever you need them. Enjoyed our talks learning about the area. Thank you! 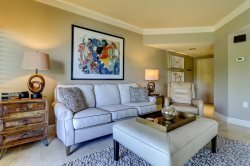 GORGEOUS CONDO AND GORGEOUS VIEWS!!! This property is wonderful. Everything you need is right there: restaurants, bakery, ice-cream, shopping, excursions, wildlife! We loved biking to the beach such a beautiful ride. You can also take a shuttle which is quick and easy. The food is wonderful and great coffee at the bakery! We saw a manatee at the dock and fell in love. We also did the craigcat boats and was so fun!! At night its so pretty to see all the boat lights. It is very peaceful and relaxing to walk the marina. This place has so much to offer for a great vacation of ANY age!